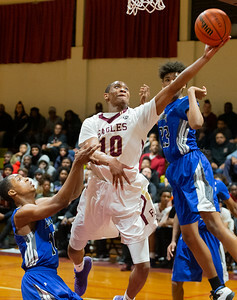 The Frederick Douglass High School Eagles won the 1A South Regional Final on March 8 against Lackey. Photos by Michael Smith. 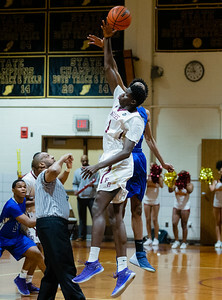 Upper Marlboro, MD, Friday, March 8, 2019: Frederick Douglass Eagles Abdou Samb (1) wins the opening tip during a MPSSAA Boy's 1A Regional Final game between Lackey and Frederick Douglass held at Frederick DouglassHigh School in Upper Marlboro, MD. (Michael R. Smith/The Prince George's Sentinel). 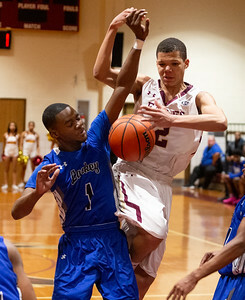 Upper Marlboro, MD, Friday, March 8, 2019: Frederick Douglass Eagles Kaylen Vines (10) blocks a shot by Lackey Chargers Kevin Cherry (24) during a MPSSAA Boy's 1A Regional Final game between Lackey and Frederick Douglass held at Frederick DouglassHigh School in Upper Marlboro, MD. (Michael R. Smith/The Prince George's Sentinel). 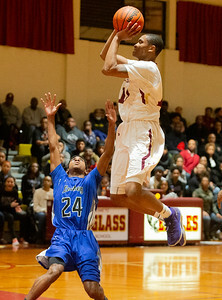 Upper Marlboro, MD, Friday, March 8, 2019: Frederick Douglass Eagles Mikhai Arnold (2) puts a shot over Lackey Chargers Kevin Cherry (24) during a MPSSAA Boy's 1A Regional Final game between Lackey and Frederick Douglass held at Frederick DouglassHigh School in Upper Marlboro, MD. (Michael R. Smith/The Prince George's Sentinel). 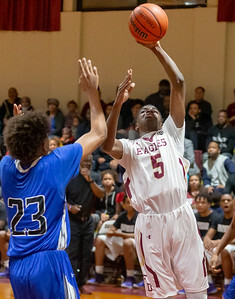 Upper Marlboro, MD, Friday, March 8, 2019: Frederick Douglass Eagles Darnell Snowden (5) commits an offensive foul during a MPSSAA Boy's 1A Regional Final game between Lackey and Frederick Douglass held at Frederick DouglassHigh School in Upper Marlboro, MD. (Michael R. Smith/The Prince George's Sentinel). 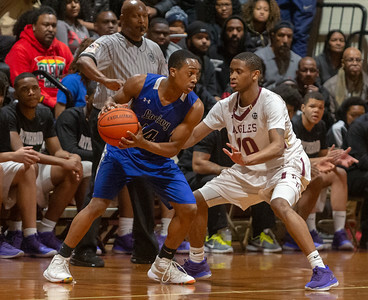 Upper Marlboro, MD, Friday, March 8, 2019: Frederick Douglass Eagles Kaylen Vines (10) guards Lackey Chargers Rasheed Cooley (14) during a MPSSAA Boy's 1A Regional Final game between Lackey and Frederick Douglass held at Frederick DouglassHigh School in Upper Marlboro, MD. (Michael R. Smith/The Prince George's Sentinel). 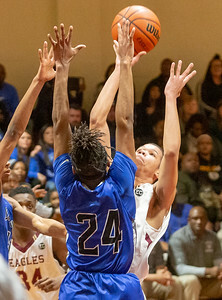 Upper Marlboro, MD, Friday, March 8, 2019: Frederick Douglass Eagles Kaylen Vines (10) takes a shot over Lackey Chargers Kevin Cherry (24) during a MPSSAA Boy's 1A Regional Final game between Lackey and Frederick Douglass held at Frederick DouglassHigh School in Upper Marlboro, MD. (Michael R. Smith/The Prince George's Sentinel). 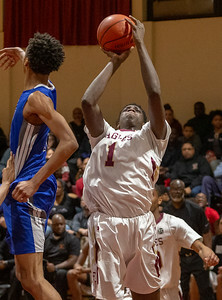 Upper Marlboro, MD, Friday, March 8, 2019: Frederick Douglass Eagles Abdou Samb (1) takes a shot in the lane during a MPSSAA Boy's 1A Regional Final game between Lackey and Frederick Douglass held at Frederick DouglassHigh School in Upper Marlboro, MD. (Michael R. Smith/The Prince George's Sentinel). 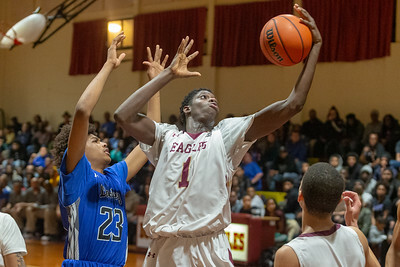 Upper Marlboro, MD, Friday, March 8, 2019: Frederick Douglass Eagles Abdou Samb (1) powers up a shot during a MPSSAA Boy's 1A Regional Final game between Lackey and Frederick Douglass held at Frederick DouglassHigh School in Upper Marlboro, MD. (Michael R. Smith/The Prince George's Sentinel). 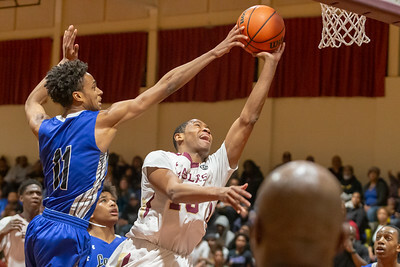 Upper Marlboro, MD, Friday, March 8, 2019:Frederick Douglass Eagles Darnell Snowden (5) gets past Lackey Chargers Amajhia Carroll (2) for a layup during a MPSSAA Boy's 1A Regional Final game between Lackey and Frederick Douglass held at Frederick DouglassHigh School in Upper Marlboro, MD. (Michael R. Smith/The Prince George's Sentinel). 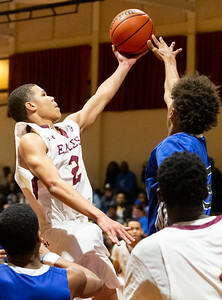 Upper Marlboro, MD, Friday, March 8, 2019: Frederick Douglass Eagles Mikhai Arnold (2) during a MPSSAA Boy's 1A Regional Final game between Lackey and Frederick Douglass held at Frederick DouglassHigh School in Upper Marlboro, MD. 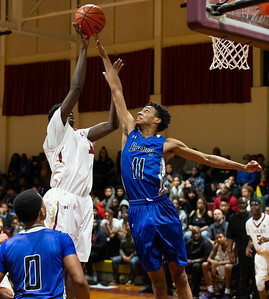 (Michael R. Smith/The Prince George's Sentinel). 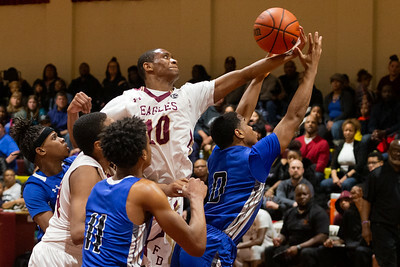 Upper Marlboro, MD, Friday, March 8, 2019: Frederick Douglass Eagles Kaylen Vines (10) blocks a shot during a MPSSAA Boy's 1A Regional Final game between Lackey and Frederick Douglass held at Frederick DouglassHigh School in Upper Marlboro, MD. (Michael R. Smith/The Prince George's Sentinel). 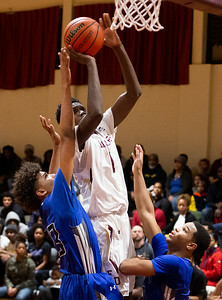 Upper Marlboro, MD, Friday, March 8, 2019: Frederick Douglass Eagles Abdou Samb (1) powers up a shot over two Lackey Chargers defenders during a MPSSAA Boy's 1A Regional Final game between Lackey and Frederick Douglass held at Frederick DouglassHigh School in Upper Marlboro, MD. (Michael R. Smith/The Prince George's Sentinel). 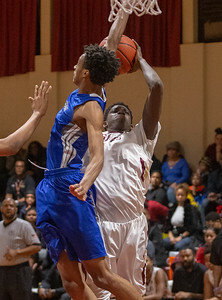 Upper Marlboro, MD, Friday, March 8, 2019: Lackey Chargers Eric Rowland (11) blocks a shot attempt by Frederick Douglass Eagles Kaylen Vines (10) during a MPSSAA Boy's 1A Regional Final game between Lackey and Frederick Douglass held at Frederick DouglassHigh School in Upper Marlboro, MD. (Michael R. Smith/The Prince George's Sentinel). 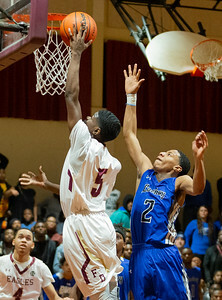 Upper Marlboro, MD, Friday, March 8, 2019: Frederick Douglass Eagles Darnell Snowden (5) gets off a shot over Lackey Chargers Darran Johnson (23) during a MPSSAA Boy's 1A Regional Final game between Lackey and Frederick Douglass held at Frederick DouglassHigh School in Upper Marlboro, MD. (Michael R. Smith/The Prince George's Sentinel). 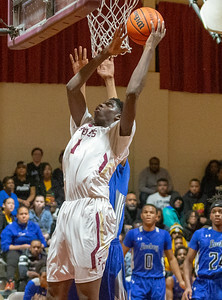 Upper Marlboro, MD, Friday, March 8, 2019: Frederick Douglass Eagles Abdou Samb (1) shots over Lackey Chargers Darran Johnson (23) during a MPSSAA Boy's 1A Regional Final game between Lackey and Frederick Douglass held at Frederick DouglassHigh School in Upper Marlboro, MD. (Michael R. Smith/The Prince George's Sentinel). 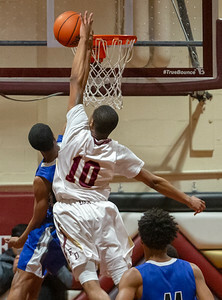 Upper Marlboro, MD, Friday, March 8, 2019: Frederick Douglass Eagles Kaylen Vines (10) grabs a rebound over Lackey Chargers Amareay Walters (0) during a MPSSAA Boy's 1A Regional Final game between Lackey and Frederick Douglass held at Frederick DouglassHigh School in Upper Marlboro, MD. (Michael R. Smith/The Prince George's Sentinel). 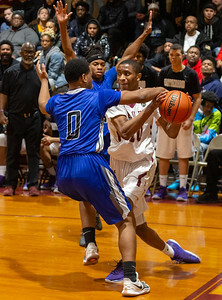 Upper Marlboro, MD, Friday, March 8, 2019:Lackey Chargers Amareay Walters (0) traps Frederick Douglass Eagles Kaylen Vines (10) on the baseline during a MPSSAA Boy's 1A Regional Final game between Lackey and Frederick Douglass held at Frederick DouglassHigh School in Upper Marlboro, MD. (Michael R. Smith/The Prince George's Sentinel). 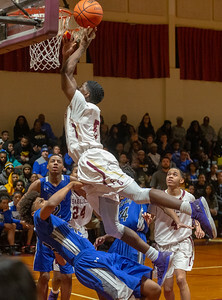 Upper Marlboro, MD, Friday, March 8, 2019: Frederick Douglass Eagles Kaylen Vines (10) glides to the basket during a MPSSAA Boy's 1A Regional Final game between Lackey and Frederick Douglass held at Frederick DouglassHigh School in Upper Marlboro, MD. (Michael R. Smith/The Prince George's Sentinel). 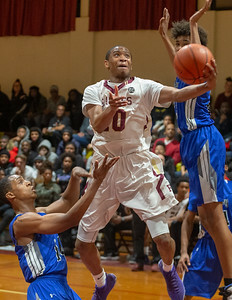 Upper Marlboro, MD, Friday, March 8, 2019: Frederick Douglass Eagles Kaylen Vines (10) gets to the basket during a MPSSAA Boy's 1A Regional Final game between Lackey and Frederick Douglass held at Frederick DouglassHigh School in Upper Marlboro, MD. (Michael R. Smith/The Prince George's Sentinel). 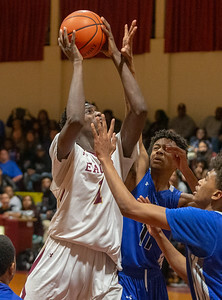 Upper Marlboro, MD, Friday, March 8, 2019: Frederick Douglass Eagles Abdou Samb (1) takes a shot during a MPSSAA Boy's 1A Regional Final game between Lackey and Frederick Douglass held at Frederick DouglassHigh School in Upper Marlboro, MD. (Michael R. Smith/The Prince George's Sentinel). 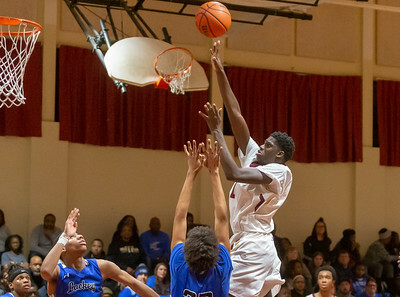 Upper Marlboro, MD, Friday, March 8, 2019: Frederick Douglass Eagles Abdou Samb (1) takes a shot over Lackey Chargers Eric Rowland (11) during a MPSSAA Boy's 1A Regional Final game between Lackey and Frederick Douglass held at Frederick DouglassHigh School in Upper Marlboro, MD. (Michael R. Smith/The Prince George's Sentinel). 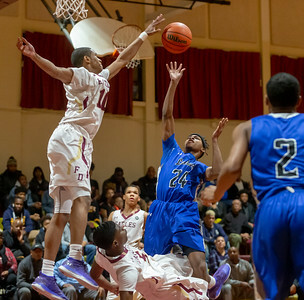 Upper Marlboro, MD, Friday, March 8, 2019: Frederick Douglass Eagles Mikhai Arnold (2) is fouled by Lackey Chargers Kinard Mack (1) while going to the basket during a MPSSAA Boy's 1A Regional Final game between Lackey and Frederick Douglass held at Frederick DouglassHigh School in Upper Marlboro, MD. (Michael R. Smith/The Prince George's Sentinel). 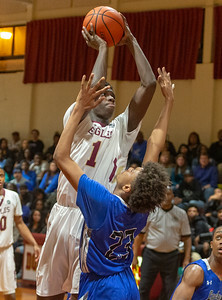 Upper Marlboro, MD, Friday, March 8, 2019: Frederick Douglass Eagles Abdou Samb (1) grabs an offensive rebound during a MPSSAA Boy's 1A Regional Final game between Lackey and Frederick Douglass held at Frederick DouglassHigh School in Upper Marlboro, MD. (Michael R. Smith/The Prince George's Sentinel). 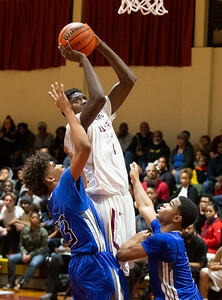 Upper Marlboro, MD, Friday, March 8, 2019: Frederick Douglass Eagles Abdou Samb (1) goes up over a Lackey Chargers defender during a MPSSAA Boy's 1A Regional Final game between Lackey and Frederick Douglass held at Frederick DouglassHigh School in Upper Marlboro, MD. (Michael R. Smith/The Prince George's Sentinel).